Don't sweat that boxy A/C unit. Here's how to put it out of sight and out of mind. If you live in a hot climate, your air conditioner is probably your favorite major appliance. However, it can quickly become a major party crasher in the middle of your backyard summer barbecue. That same hulking, boxy piece of machinery that cools your house can be an eyesore in your garden. But don’t sweat it. There are plenty of ways you can hide, mask, conceal and block your air conditioning unit so you won’t even know it’s there. Here’s how to keep your cool. First keep in mind how your air conditioner works and what keeps it happy and efficient. An A/C unit needs space to breathe. Because it works so hard to make the inside of your house cool, it needs to vent a bunch of generated heat. The reason that the metal casings of air conditioning units are perforated is to do just that. Keep this in mind when adding any sort of cover or obstruction near your machine. To be safe, check the manufacturer’s recommended distances for any sort of enclosure. 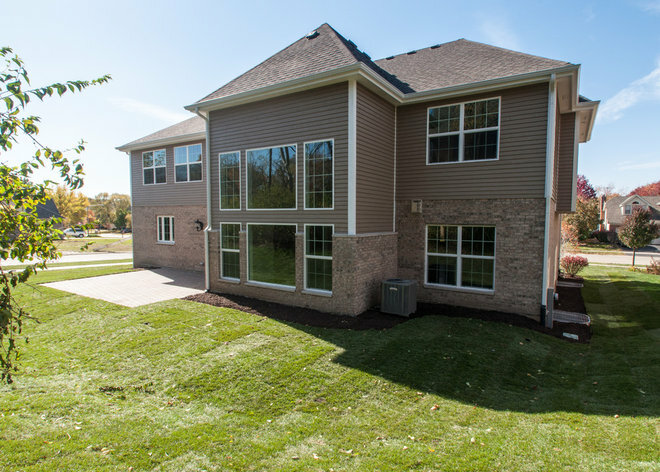 When designing your new house or retrofitting for a new system, remember that a happy air conditioner is one that doesn’t have to work so hard. One way to ensure this is to use energy-efficient methods of home design that can reduce your reliance on air conditioning and keep as much cool air inside your home as possible. Another way to design an efficient system is to make sure that your unit has a cool, shady spot in which to work. Place it on the side of the house with the most protection from the sun, so that it doesn’t heat up too much. This will keep it running more efficiently (which is great for the wallet) and can help avoid noises and malfunctioning associated with overheating. Now on to the tips for minimizing visual impact. One of the most common approaches is to simply hide the air conditioner from view. For ideas on fences and screens that could work for your garden, take cues from elements you already have in your garden to maintain an integrated look. 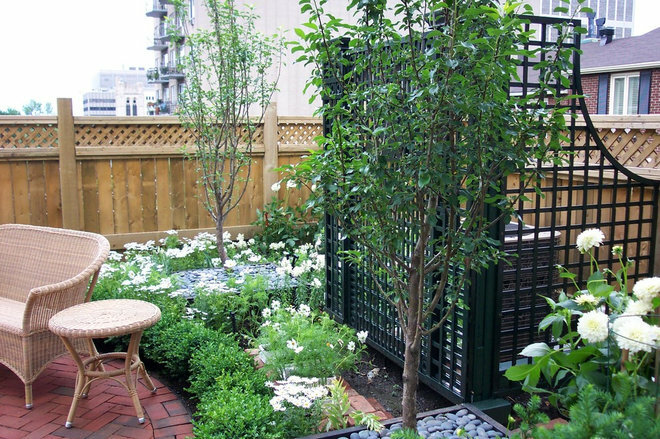 You can also check out some of the great ideas on Houzz for fencing. Keeping space for ventilation in mind, consider creating a dedicated structure to offer shade to a machine that may not be located in the best spot. Depending on your garden needs, this could even be incorporated with a place to store the lawnmower, hose, pool care supplies or other stuff. 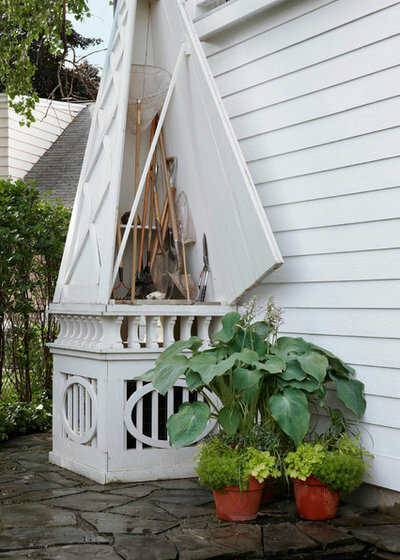 In this example a structure built on to the side of the house disguises the unit while also providing a spot for garden tools. Another idea is to group your outdoor machinery into one accessible, well-ventilated structure. The example shown here is an enclosure for a pool pump, but it could easily be modified to fit the size needed for an air conditioner. Taking it a step further, you could even build a full-height equipment shed, capable of housing your unit, any pumps you have for your garden and whatever garden tools you need to store. If you’re considering a garden makeover anyway (to prepare for all of the awesome summer barbecue parties you’ll be having), this may be a good opportunity to design a system of utility spaces that are closed off from view. 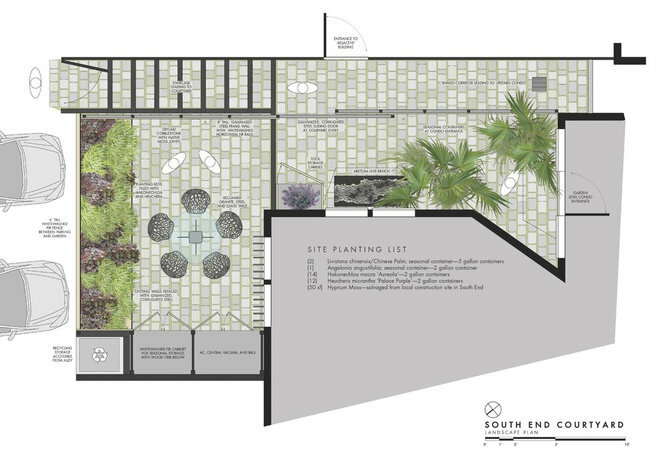 In this example a relatively small courtyard in Boston has been optimized for some garden storage solutions, as well as for a utility closet that houses the A/C unit, seen at the bottom left portion of the rendering. 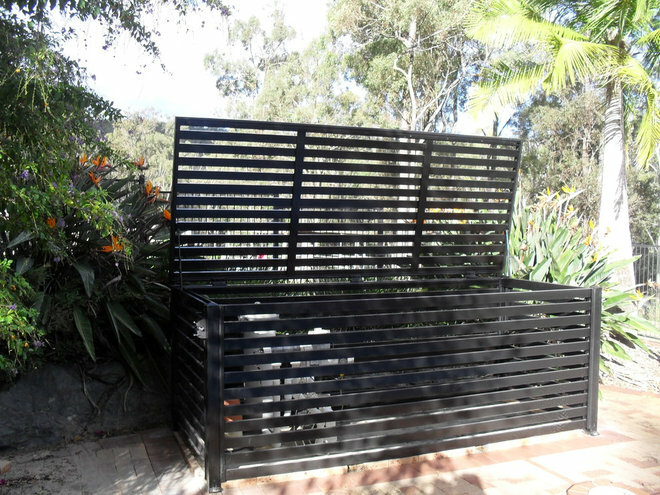 A custom cover or integrated patio furniture may be a little expensive for some; a plant screen is a good budget alternative. 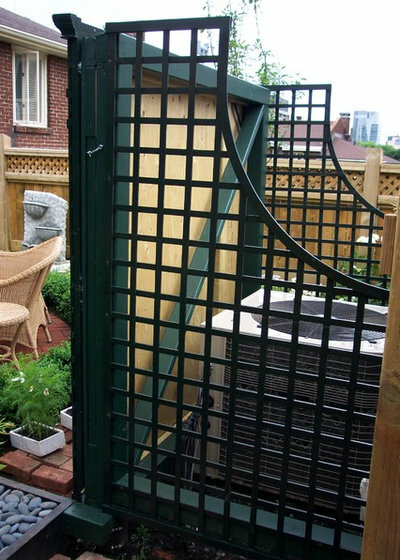 This simple trellis covers the air conditioner, leaving access to it from behind and adding a vertical element to the garden design. You could even integrate this with your veggie garden to allow climbing plants, like beans, to grow vertically. 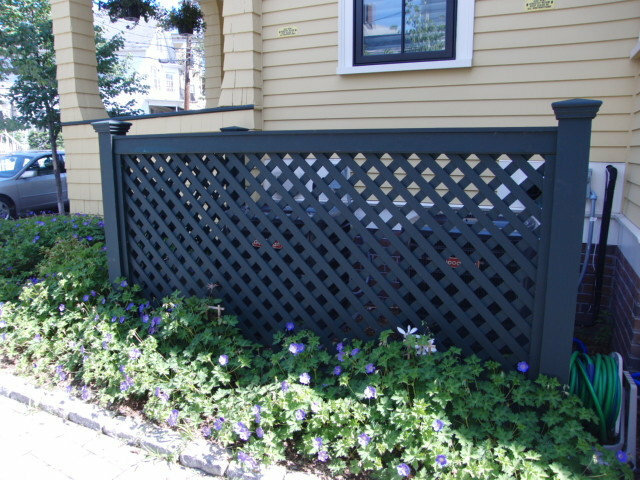 Some premade trellis systems, like this one, also have an access door from the front. 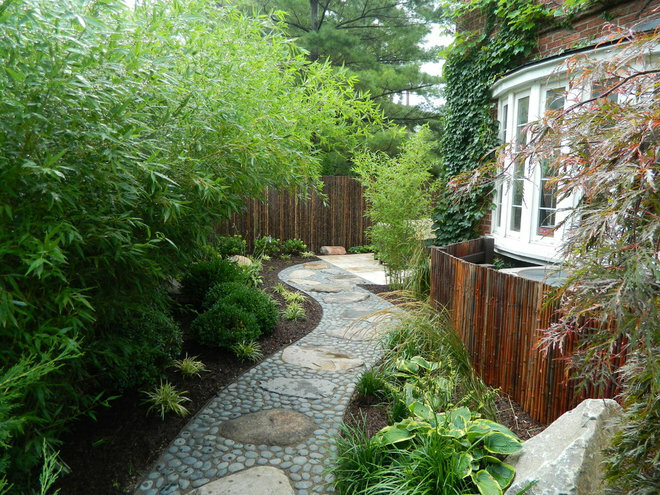 Savvy landscape designers will tell you that the key to a beautiful garden, even one with a large air conditioner in the corner, is to direct the eye to a beautiful framed view. In this garden the unit on the right behind the low fence is hardly noticeable, because our eyes are drawn down the path, while the matching fences become backgrounds to lush vegetation.